The leaves have begun to turn along the Gunflint- the yellows and gold of the birch, poplar and green ash began turning a few weeks ago along with the reds and gold of the moose maple. As you climb the hill out of Grand Marais the reds of sugar maples are beautiful. The tamerac, which are the last tree to turn, have yet to turn. In another three weeks they will be turning to bright gold and you will know that the fall color season is over. 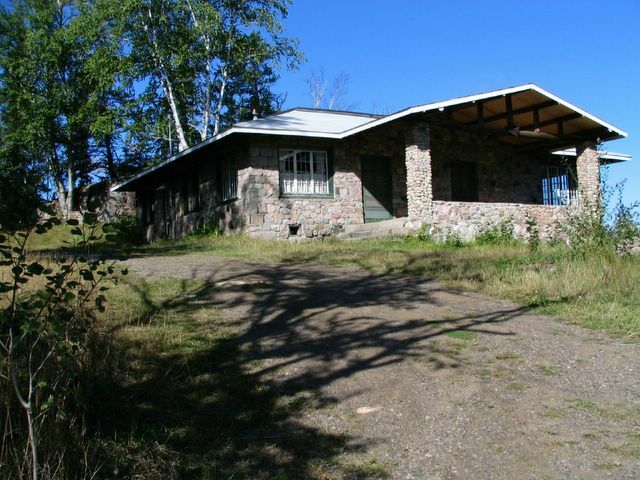 The old Chik-Wauk Lodge is the proposed site of a new Gunflint Trail Museum. The building located at the end of the Gunflint Trail on Saganaga Lake is currently own by the USFS. The Gunnflint Historical Society is currently working with the USFS about using the site. For additional information go to the Gunflint Historical Society's press release. gazed up at the star-filled Mississippi sky with three-year-old Anna between us. and strip joints. New Orleans is also the Voodoo capitol of the United States. pull a stiff dead rooster out of his trunk. “It is a weird story,” the officer replied. Saturday morning, I woke before Anna and John and snuck out for coffee. “evacuate,” but I didn’t make the connection. enough north to be spared the brunt of the storm. Louisiana Governor Kathleen Blanco speaking to the residents of New Orleans. named Bob, his wife Niki and his guide dog. Mississippi, a balmy breeze teased the surface of the river. flinging insects into our faces. “Those are big, dead bugs,” I told him. the dog crawled between my rocker and Bob’s. It was time to turn in. have taken only three hours and 13 minutes. phones stopped working and we hadn’t seen a newspaper for days. moving at 75MPH. I told the shuttle driver I was scared. broke. As more news leaked onto the boat, grief was palpable. likely she was just crying over popcorn. can pay is fine,” he said. at the photos from Louisiana, Mississippi, Alabama and Florida. lemonade stands in our neighborhood. carve a way through Impossible. hope they can expand as much as they can break. Copyright © 2005 Jenny Schroedel. All rights reserved. International copyright secured. Help Hurricane Victims Focus on the Family has created a secure donation page to receive aid for those who have been affected by hurricane Katrina. We are forwarding every dollar donated on this page to relief organizations working with victims along the Gulf Coast. When commissioners from Cook, Lake, and St. Louis Counties and members of the Grand Portage Tribal Council sent a letter to Governor Tim Pawlenty on July 26, 2005, asking for a meeting to discuss the "Final Rule for State Petition for Inventoried Roadless Area Management," it was just the latest round in a decades-old debate surrounding roadless areas. Commissioners hoped to meet with the governor to discuss the 60,000 acres of roadless areas in Cook, Lake, St. Louis counties and 1854 Treaty Lands. The Arrowhead region governmental entities have yet to hear from Governor Pawlenty. However, another group, the Minnesota Forest Resources Council (MFRC) has been tasked with studying the petition process and giving the Governor a recommendation on how to proceed.MFRC is a multi-disciplinary technical team, which was established in 1995 to coordinate the development of timber harvesting and forest management guidelines. The lone voice for Cook County on the MFRC is that of local outdoor writer, Shawn Perich of Hovland. This is a matter that has been under debate for decades-and which could end up costing the state millions of dollars with ultimately no difference in how the Forest Service manages the state's roadless areas. Since the governor tasked MFRC with giving him a recommendation on how to proceed, Perich has been studying the roadless issue. In a recent interview he shared a brief history of the issue, noting that the debate started in 1970, when the Forest Service began a study to identify primitive areas and inventory all roadless areas in National Forests and Grasslands greater than 5000 acres. That study was called the Roadless Area Review and Evaluation (RARE). The process was challenged in court and came to a stop in 1972, only to be resurrected in 1978 as RARE II. This time the Forest Service worked to identify and inventory areas that were roadless or undeveloped using the criteria that qualifies land for inclusion as part of the National Wilderness Preservation System. The RARE II process was also challenged and eventually a court ruling found that the national evaluation of roadless areas was not site-specific enough and that it did not consider a wide enough range of alternatives. In February 1999, the debate began anew when the Forest Service issued an 18-month moratorium on new road construction in national forests to give the Forest Service the opportunity to examine its roads policy as it entered the 21st century. During this time, the Forest Service collected and analyzed public comments. In response to overwhelming comments supporting roadless area conservation, President Clinton directed the Forest Service to develop a roadless policy focused on conservation of all inventoried roadless areas. In January 2001, the Roadless Area Conservation Rule was adopted.However, along with the change in administration came changes to the roadless rule. After much debate on a national level, on May 5, 2005, President Bush repealed the Roadless Area Conservation Rule and put in place the new petitioning process. Governors were given 18 months to petition the Secretary of Agriculture, to submit their own management recommendations. If Governor Pawlenty chooses to submit a petition for review of roadless areas, the state must identify roadless areas in need of protection, map them, and design individual management recommendations, all before November 2006.That, said Perich, is what concerns him. "There's not a lot of time to get all that work done. And, the state could spend a fortune developing these management plans-and the Secretary of Agriculture could deny the whole thing. "If the Secretary of Agriculture denies the petition, the management of roadless areas throughout the state, including the 60,000 acres in the Arrowhead, remains the same as planned in the latest Forest Plan. Even if the Secretary of Agriculture approves the state's petition, that is only the beginning. If approved, the state and the Forest Service are then required to jointly develop a specific management plan for the state's roadless areas. Many Cook County residents hoped that the governor's option to petition could be used to review the Forest Service decision to declare the Vegetable Lake area of Cook County a semi-primitive non-motorized area (SPNM), possibly even leading to a reversal of the non-motorized designation. Commissioner Bob Fenwick said it isn't that easy. He noted that while no single roadless area was being singled out for debate at this time, it could if the governor chose to pursue a review of the state's roadless areas. "In a nutshell, is anybody singling out any one roadless area, like the Vegetable Chain today? No. Could any one single roadless area be managed differently in the future than it is today? Yes. "Fenwick feels strongly that the county should be involved in any roadless area discussions. "In the petition process, the federal government has done something unique. It has indicated that local governments should have a say. We don't want the governor to say 'forget it.' We'd like some say in the management of the land in our county." While the Gunflint Trail maybe on the other side of the country from the tragic disaster that is playing out in New Orleans and the Gulf Coast, the Trail does have it Gulf Coast connections. Of course we are sadden by what occurred while others on the trail have their own person connection. "Thank you so much for your concern! It has been a terrible tragedy that has hit new orleans. It's just so sad that so many people have lost their homes. We did have alot of damage where we were. Mostly trees and power lines. It felt like the blow down that we had up there a few years back. Although it's hot as hell down here and we don't have a lake to bath in. I'm very glad that we everyone in my family made it safely through it. Denise's apt (Patsy's sister) in New Olreans flooded a little bit, but the damage came from the looters. She hasn't been there to see for herself but we've seen some on the tv. I do appreciate the email, and everyone appreciates all the support provided to help us through this devestating storm. Thanks again!-patsy"
For those of you on the Gunflint that would like to contact Patsy her email address is patsy.dupuy@neill.net. Then there is Sue Campbell, who works at Trail Center and who grew up in New Orleans. Sue still has relatives in the city including her father. Just prior to the storm Sue called her father and at that time he was determined to ride out the storm in his house. She has not heard from him since. Perhaps one of the more unusual stories is that of Char Nelson from Windigo Lodge. Earlier this summer several women from New Orleans were staying at Windigo. As the ladies were checking out of the lodge, Char mentioned she had a good friend who she had gone to nursing school with and when this friend moved to New Orleans several years ago Char lost touch with her. When Char mentioned her friend's name to the women they explained that Char's friend was a neighbor and they knew here well. Char gave the departing ladies her phone number to give to her long lost friend. Fast forward several weeks- Katrina hits New Orleans, and Char receive a phone call from her friend. Char's friend exclaims that she is still a nurse and after the storm she was flown to the Houston Astrodome to provide medical assistance. She then explains to Char that upon arriving at the Astrodome she was the only health profession there and there were some fifteen thousand refuges at the Astrodome and more arriving hourly. Char friend then when on to say that, "I need help, get done here right away we need nurses desperately." Char told her friend that because she is no longer licensed as a nurse she can not help, but she will contact her acquaintances in the medical field in Duluth about sending help." Hopefully, more medical professionals have arrived at the Astrodome by now. Then there are those Trail residents that can assist and our on their way to the Gulf States or as Sue Kerfoot put it. "Bruce and I have received an offer of a free trip to New Orleans and the Gulf Coast from the Red Cross. We anticipate leaving on Saturday (9/4) and returning on Friday (9/23)." More on their experiences latter. The BWCA's blow-down pales in comparison to the disaster Katrina wrought onto our neighbors on the Gulf Coast. Help is desperately needed. The Cook County community is mobilizing to help send disaster relief to stricken Gulf Coast communities. The Grand Marais State Bank is currently accepting checks for the Salvation Army. Checks brought to the bank should have "disaster relief" written in the memo space. Donations can also be made online at www.thesalarmy.com. People can also make donations to the Red Cross disaster relief effort at www.redcross.org or call 800-435-7669. FMAS's list of organizations to donate services or funds to for the Gulf Coast relief- can be found at- http://www.nvoad.org/membersdb.php?members=National. Hopefully the Gulf Coast communities will be treated better by FEMA then the miserable treatment the Gunflint Trail received after the "Blow Down." However, thus far FEMA and the Federal government's performance in Gulf Coast has been dismal.